Drawing on over a decade’s experience at the Gallup Poll and a distinguished academic career in survey research, David W. Moore praised as a “scholarly crusader” by the New York Times reveals that pollsters don’t report public opinion, they manufacture it. 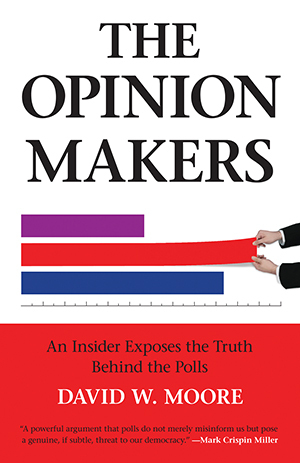 In this highly critical book, he describes the questionable tactics pollsters use to create poll-driven news stories-including force-feeding respondents, slanting the wording of questions, and ignoring public ignorance on even the most arcane issues. More than proof that the numbers do lie, The Opinion Makers clearly and convincingly spells out how urgent it is that we make polls deliver on their promise to monitor, not manipulate, the pulse of democracy.